Artist & architect Friedrich Stowasser (1928 - 2000) changed his name to Friedensreich Regentag Dunkelbunt Hundertwasser which roughly translates as 'Peace-rich or Peaceful, Rainy day, Darkly multicolored, Hundred water.' 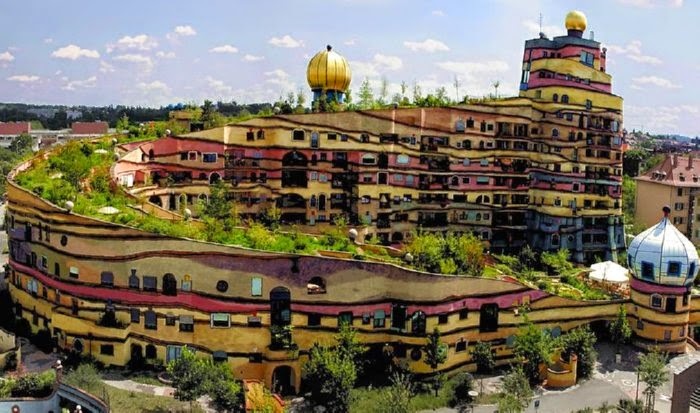 Hundertwasser had an Austrian Catholic father who died when he was a small child and a Jewish mother. He and his mother escaped the fate of much of her family by posing as Catholics. He traveled extensively as a young man and enrolled at the Ecole des Beaux Arts, Paris, but left after a day. For years he lived, traveled the world, and painted on a reconstructed salt hauler sailboat which he called the “Regentag” (rainy day). He also owned a farm cottage in northern France and a cabin in New Zealand. Hundertwasser felt a special connection to New Zealand, and was buried there when he died in the year 2000.